Share This Post: What Is A Landing Page And Why Should You Care? What Is A Landing Page And Why Should You Care? Dedicated landing pages are an important tool for your paid search and/or email campaigns. It’s amazing to me how many companies are still dropping visitors on their homepage, instead of creating a dedicated landing page to match the offer. Whether it’s lack of time, lack of knowledge, or just laziness that is keeping you from implementing dedicated landing pages into your marketing mix, you should know that you are leaving money on the table. A dedicated landing page, or a custom landing page, is exactly what it sounds like; a page that is constructed for a very specific purpose or goal. It is not meant to showcase a wide array of products, or to introduce a visitor to your company or service and hope they bookmark the site and return when they have time. The purpose of a landing page is to capture a lead, sell a product, and/or provide a download. It is generated to accomplish a ‘goal’- right here, right now. Dedicated landing pages are the entryway into your site for visitors that you are actively targeting. They should be worked into all of your online marketing initiatives — from search to social, b2b, b2c, etc. When implemented correctly, a page that is created with a specific goal will likely produce dramatic results. In a blog article from 2013, Kelly Lorenz from Bronto (a marketing automation service) estimated that in her experience, “…95% of online marketers who use email don’t use custom landing pages.” Too many companies are making this costly mistake; custom landing pages are key to conversions on a website. According to Hubspot.com: a dedicated landing page should convert 5-15% better than the main pages of your site. With some testing and tweaking, the improvement could be considerably higher. Who wouldn’t be interested in a potential 20% increase in conversions? The concept of a landing page is simple: a page with one clear goal will likely be more effective than dropping a visitor on a general page or home page. However the creation and implementation requires tailored knowledge of how people interact with online information, and the ability to test various elements of the page to achieve optimal results. There are plenty of tools and tests that can help you with constructing a page that conforms to best practices, but every industry is different, and understanding your visitor and how they process information is imperative. You can base your decisions on what has worked for other people, but that will only take you so far. A good landing page should be able to engage a visitor within the first few seconds, giving them what they need, and enticing them to give you something in return. 1. Where Am I? – There should be no need for explanation here. A visitor should know exactly where they are when they see a custom landing page. You can accomplish this by consistent design and messaging that makes a seamless transition from the advertising medium to your site. If the visitor is coming from an email, the email should have the same look and feel as the website. This includes logos, colors, language, etc. If a visitor feels disoriented, there is a good chance they will hit the back button. Make sure your page fits in with where they previously were – no surprises, no second guesses. 2. What Can I Do Here? – This should be very clear, with limited options. The landing page has a goal, and hopefully that fits in with visitors’ agendas. Resist the temptation to offer multiple choices to appeal to different intents. Your marketing should already be heavily segmented by interest and intent; your past research will likely target the right person with the right offer. 3. Why Should I Do It? – Or, ‘what’s in it for me?’ This is the most challenging of the three questions. There are plenty of other places offering something similar. What makes you stand out and worthy of winning the visitors’ trust and/or business? Think of this interaction as a conversation between you and the visitors. If they feel disoriented, or you do not appear to be the best choice in an endless sea of options, it’s a simple case of hitting the back button and moving on to the next. It’s likely that you paid for this visit (click), so you don’t want them walking out the door. If they do, there’s a good chance they will not be back. Designing a custom landing page is not something that can be based on opinion or assumptions; it requires a very clear understanding of your target audience – what they need, what they know, and what they don’t know. It doesn’t hurt to have a basic understanding of how people interact with webpages and how they process information. A quick search in Google will bring up a wealth of results from landing page tests. Testing various elements is essential to the design process and it is a mistake to assume you know how your audience will interact with your landing page. We can control the focus of our visitors using subtle or not-so subtle visuals. This example has been used before, but it’s worth repeating. 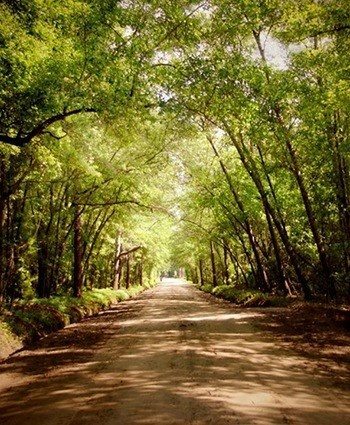 If it is obvious, people will follow the path that is laid out in front of them. By keeping the visitor moving down a calculated route, you can get them to the desired destination without letting them get side-tracked by distractions. 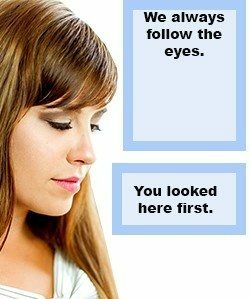 The Department of Social Psychology at the University of Padua, Italy conducted a study demonstrating that people are unable to resist following the gaze of another person and similarly, the same goes for directional arrows. There is a reason you see so many landing pages with giant colorful arrows pointing at the call-to-action. A more subtle approach is the use of faces that are looking in a specific direction. If you were not aware of this until now, you will notice it immediately the next time you encounter it in an advertisement. A good landing page will take advantage of the brain’s subconscious habit of following visual cues that direct you towards a specific call-to-action. Most people tend to quickly scan a webpage; they don’t read it like they would a book or an article. The use of bullets and headlines are going to get the reader’s attention. This is where you make it clear to the visitor: this is what you will get. List the benefits and features of your offer. Keep it simple and stay on message. Use only enough information to get your point across. This is probably the most contentious subject on the construction of a good landing page. Some people will tell you with the utmost confidence that ‘People don’t scroll’, others will tell you that ‘In this day and age, people are used to scrolling and above the fold is outdated’. We are living in a multiscreen world, one person’s fold is another person’s full screen. Perhaps your page requires more than four or five bullet points to provide the necessary information to help the visitor make their decision. The top of the screen is prime real estate, but do not feel that you need to cram everything into a limited amount of space. A cluttered page is far more distracting than having to move a mouse or swipe a finger. Make your case as quickly as possible and try to keep the call-to-action in view regardless of where the visitor is looking on the page. If it seems like I have mentioned the importance of testing in every paragraph of this article, it’s because I have. There will undoubtedly be more articles on our blog that focus entirely on testing, but it’s essential to creating landing pages that convert, so it must be mentioned here. Testing page elements requires more effort than simply making arbitrary changes to the page and hoping the conversion rate improves. Testing is a science and calls for a process. There are quite a few online tools that allow you to create multiple versions of your page and automatically divide your traffic between versions until a winner has been determined. Test as much as your time or budget will allow, and then test a little more. Your landing page conversion rate can always improve. And if you hit 100% conversion rate – please call me, because I would like to know your secret. Dedicated landing pages are often one of the last tactics put into play with online marketing efforts, if they are put in play at all. In my opinion, this is a mistake and they should be taken into consideration at the start of a new website or marketing campaign. You would be hard pressed to find an example where landing page creation was a waste of time and money, so what are you waiting for? If it’s true that 95% of companies are dropping visitors on a webpage that they think is ‘good enough’, then there is still time for you to get a competitive edge. Find a partner that understands the importance of having dedicated landing pages and has the tools and experience to assist you in creating a beneficial tool for your website. There is money on the table, and you should grab it before someone else does.